Handle covers blade to protect hands. Ergonomic grip with thumb rest for maximum comfort. High-impact polymer coating increases strength and durability, 45 percent more cutting depth, 10" carbon steel blade included. Polished nickel frame adjusts to 10" and 12" blades, molded pistol grip handle, 2-3/4'' depth of throat. Highest quality heat-treated, high carbon, long steel blade with 32 teeth per inch. Used to cut wood, plaster, steel, brass, in tight quarters. Metal with lightweight, cast aluminum handle built for durability and designed for comfort. Includes a high performance 10" Bi-metal blade. 225 lbs. blade tension; 90 and 180 degree adjustable blade angle allowing flush cuts; large, comfortable tension knob; robust all metal frame; full-grip handle helps protect knuckles. Rugged heavy-duty aluminum handle. Fits into tight spots allows for flush cutting applications. Bi-metal blade included. Aluminum close quarters hacksaw cuts brass, copper, iron pipe, steel, PVC, and wood. 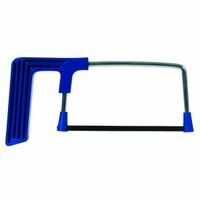 Ergonomic cushioned handle; gets into small places making difficult cutting jobs easy; uses any standard size hacksaw blade; fits into any tool box; includes (1) 10? hacksaw blade. Instantly adjustable for 10"/250mm to 12"/300mm blades. Adjusts 90 degrees for vertical or horizontal cuts. 3-1/2'' depth of throat. Includes: (1) 10" blade. 225 lbs. blade tension; 90 to 180 degree adjustable blade angles allowing flush cuts; large, comfortable tension knob; robust all metal frame and full grip handle helps protect knuckles. I-beam frame construction made from high impact polymer with steel core with a 12" fixed frame. Sloped nose for access into tight, hard-to-reach places, ergonomic non-slip grip. Easy open lever for quick and easy blade change. Lightweight aluminum beam achieves 15K PSI; durable aluminum handle for a confident grip in most work environments; mount blade at 45 degrees for flush cutting applications. Lightweight aluminum beam achieves 20K PSI; durable aluminum handle for a confident grip in most work environments; mount blade at 45 degrees for flush cutting applications. 300 lbs. blade tension; 45 and 90 degree adjustable blade angles allowing flush cuts; blade storage holds up to 8 blades; bi-material handle for comfort; large, comfortable tension knob for quick & easy blade change; robust tubular metal frame and long reach cutting capability. Rugged, lightweight frame with screw-operated lever for tensioning the blade up to 30,000 PSI. Blade can be positioned for 45 or 90 degree cutting and spare blades can be stored inside frame; end of frame can be used as a jab saw. Adjustable crank handle for tension up to 30,000 PSI torque and micro-adjustment. Quick changing blades with spare blades stored inside frame. Blade can be positioned for 45 degree or 90 degree cutting; end of frame can be used as a jab saw. Light weight saw will tension up to 20,000 PSI. Front tension mechanism is easy to hold and adjust. Mount blade at 90 degrees for flush cutting applications. Comes with one 12", 24 TPI hacksaw blade. Durable, one-piece body is designed for ultra-high tension of 330 lb and a large cutting capacity up to 4-3/4" throat depth. Pre-tensioning mechanism holds blade in place for quick and easy blade changes, thumb dial adjustable tension mechanism, power load sliding tension and a contoured handle with a front thumb grip; ergonomically designed for control. Comes with 24 TPI bi-metal blade. Advanced twist on the classic hacksaw design; blade cuts at both 45 and 90 degree angles for clean and effortless flush cuts; high tension locking system holds the blade firmly in place and helps prevent twisting; low profile design allows easy cuts in the tightest of spaces; long reach blade offers extended cutting capability and front handle design transforms instantly into a high performance jab saw. I-beam construction that allows blade to tension up to 50,000 psi, resulting in fast, straight cuts. Convenient blade storage up to 5 extra blades, converts to a jab saw; accepts any Lenox reciprocating saw blade. Rubberized grips on handles allow for confident handling even in wet or cold environments. Comes with one 12", 24 TPI hacksaw blade. Fully adjustable tension, holds blade up to 32,000 PSI, blade storage in frame. Quick-release, blade-changing mechanism, tension guide on handle lever, 3-7/8" throat depth. Hacksaw or reciprocating blades extended out nose of frame can be locked into place for tight clearance work.